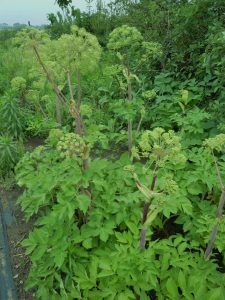 Angelica archangelica OK, it’s really a biennial but it might as well be a pe rennial because it reliably self-seeds. How could you not like a plant that flavored reindeer milk in Scandinavia? Philip Miller (1768) claimed it got its name “from the angels, on account of its excellent qualities.” At 5-6’ tall its chartreuse umbels tower over every other flower in late spring – such a fresh color and compliment/complement to white, blue, purple, red, pink, orange- oh, every color in the wheel. Brunnera macrophyllum, Siberian bugloss. As far as I’ve seen this does not loose bugs but who knows what happens in Siberia? Clusters of small robin’s egg blue flowers contrast against its big leaves. The color is so arresting that Martha Stewart co-opted it. twelve gods – appropriate. The leaves start to emerge from the cold dirt while Snowdrops are still blooming. Could this flower’s shuttlecock shape have inspired the game of badminton? Geum triflorum, Prairie smoke. Remember the troll doll? Prairie smoke’s dangling pink flowers turn to pink flowing hair-like seeds looking ever so much like a troll doll’s hair. The Blackfeet used it to cure fuzzy thinking – the problem seems universal. Its roots made a love potion for Okanagan-Colville women. Lathyrus vernus, Spring vetchling. Just gorgeous – rich red-purple pea blooms. Lupinus perennis, Old maid’s bonnet, Lupin. Texas has its Blue bonnets; the north has Old maid’s bonnets. The Menominee fed this to their horses to make the horses spirited. But then Menominee needed to rub this on their own legs so they could control their spirited horses. Primula veris, Cowslip. Mystery, did a cow slip on this? 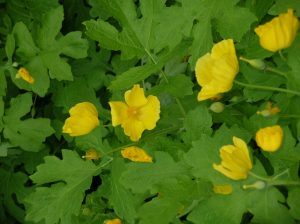 In the 1500’s in England this plant made women “more beautiful.” Its sunny yellow trumpets announce the beginning of spring. Generally primulas are finicky about their growing conditions – not this. 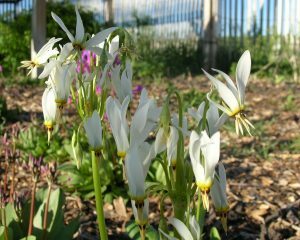 It grows everywhere – sun, shade, wet, dry, and slowly self-seeds in the lawn. Pulsatilla patens, Eastern pasque flower. This one had to grow on me (pun). It takes about two years after planting before it looks like much but then, it’s so early and so reliable, stunning.